Woburn, MA, September 12, 2012—Innovations in Optics, Inc. offers a new generation of ultra-high brightness LED Light Engines with integrated fluorescence excitation filters for use with many types of life science instruments. LumiBright LE Light Engines use state-of-the-art LED technology and interference filters with hard dielectric coatings to meet the most demanding requirements involving fluorescence excitation in life science instrumentation and medical illumination. Although most of the energy from a selected LED will be emitted in the excitation spectral region of a distinct chromophore, secondary regions of emitted energy at shorter and longer wavelengths from the LED may be undesirable for some fluorescence applications. The ability to add excitation filters to each LumiBright LE Light Engine ensures the excitation energy spectrum is optimized for the intended application. Specific applications for integrated fluorescence excitation filters are life science instruments such as: gel & blot imagers, real-time PCR systems, cytometers, colony counters, microplate readers and gene array readers. The filtered light engines support easy integration into OEM or end-user systems. Excitation filters are available from Innovations in Optics at several center wavelengths and bandwidths. Important to fluorescence applications, the filters feature in-band peak transmission greater than 92% and out-of-band blocking greater than OD7. Custom filter specifications can be accommodated for sufficiently high volume products. 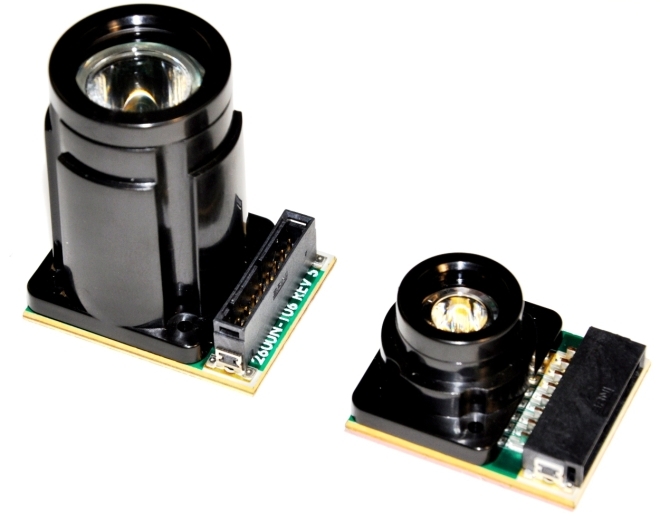 LumiBright LE Light Engines feature patented non-imaging optics that direct LED light into a desired cone angle, while producing highly uniform output, both angularly and spatially. The two standard half angles are 20 and 41 degrees. Available peak LED wavelengths range from 365 nm through the near-infrared, or as broadband white, configured as dense chip-on-board LED arrays with single or multicolor options. LumiBright light engines offer intense and stable optical power, short warm-up time, high energy efficiency, low maintenance and long rated life. Some models can be fiber-coupled, and supplied with a photodiode for feedback light control. Light engine system accessories include thermal management devices, wire harnesses and driver/controllers.